Free Shakespeare in the Park – Prospect Park! 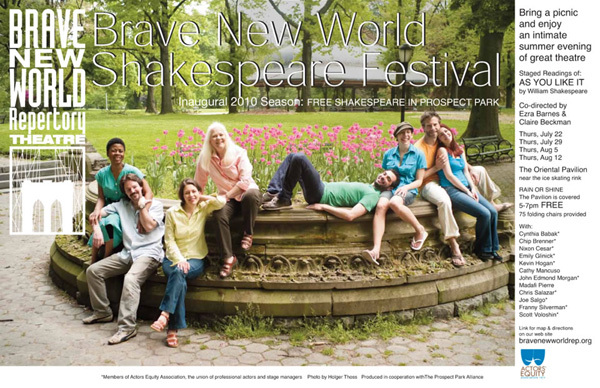 Brooklyn’s Brave New World Repertory Theatre will kick off its inaugural season of the Brave New World Shakespeare Festival in Prospect Park with four staged readings of As You Like It FREE to the public on Thursdays beginning on July 22, 29, August 5 and 12 at 5pm. Free events for children including a storybook hour of As You Like It for kids 3-6 and workshops for children 7-12 will begin at 4pm before the performances. As You Like It will take place at The Oriental Pavilion in the southeast corner of the park. Enter at the Lincoln Road or Parkside entrances. Prospect Lefferts Gardens residents once again have easy access to the best of Brooklyn’s cultural offerings. The readings will be performed in the round, as Shakespeare’s plays were originally presented. There will be seating for 99, with additional standing room also available. Known for its bold and critically acclaimed productions, Brave New World already has plans to expand their Shakespeare Festival and mount a full production of a yet un-determined play in Prospect Park in summer 2011, according to Claire Beckman, BNW’s Producing Artistic Director. Commenting on this inaugural season, Ms. Beckman says, "The pastoral setting of As You Like It lends itself perfectly to performing outdoors, and the indoor court scenes will also work beautifully in the majestic Oriental Pavilion which is an open air venue that can shelter a large cast and audience from a light summer rain.” She notes that “the play features one of Shakespeare’s most famous speeches, ‘All the world’s a stage,’ which is certainly Brave New World’s philosophy, and why we enjoy bringing theater to every corner of the Borough of Brooklyn." Ms. Beckman serves as director with assistance from BNW company member Ezra Barnes, founder and former Artistic Director of Shakespeare on the Sound in Connecticut. The cast includes: Cynthia Babak, Chip Brenner, Nixon Cesar, Kevin Hogan, Cathy Mancuso, John Edmond Morgan, Madafi Pierre, Chris Salazar, Joe Salgo, Franny Silverman and Scott Voloshin. Brave New World was formed by professional theater people who lived in Brooklyn and wanted to perform in Brooklyn. BNW started on the path of presenting bold, critically acclaimed site-specific productions in 2005 with its cutting edge production of To Kill a Mockingbird, staged on the Victorian front porches of a tree-lined Ditmas Park street. Since then, they have staged Fahrenheit 451, The Great White Hope, and Crossing Brooklyn Ferry, based on Walt Whitman’s Leaves of Grass all for Celebrate Brooklyn at the Prospect Park band shell, On The Waterfront by Budd Schulberg, performed on the Waterfront Museum Barge in Red Hook, and on tour to Pier 84 in Manhattan and Hoboken, and most recently, The Tempest on the Coney Island boardwalk.